Happy Halloween! And with the last day of October here, midnight means one thing–the start of NaNoWriMo. Yeah, I’m the second one. Now, I’ve never done a midnight kickoff party (probably as Halloween hasn’t fallen on a Friday or Saturday since I started participating), but all over the forums tell me there are novelists ready to head out for their first write-in as the clock hits midnight. What the forums also tell me is that a number of plotters out there are feeling the crunch for figuring out the ending of the novel they’ve spent much of October outlining. For those who aren’t familiar/haven’t heard me use the term before, NaNoWriMo tends to divide participants into one of two groups: the Plotters (who outline their plot before the start of NaNoWriMo to work off of) and the Pantsers (who “fly by the seat of their pants” and write whatever comes to them at the spur of the moment). Both for November and in general, I tend to be the latter. If I don’t have a good reason to work out some rough outline (namely it’s a part of a series) I tend to start writing whatever comes to me. So far it has served me pretty well. So why, then, do I feel at all qualified to address the plotters out there about their style? Mostly because, even if you need everything else plotted out, I feel there is some merit in not knowing your ending. If your story doesn’t spring to life with the ending already in place in your mind, there is no need to stare at your outline worrying about how you can’t write until you know if the Main Character (MC) is going to die, if the final game will be won, or really anything that happens after your climax. Once you get to that point, where you’ve been with these characters for thousands of words, figured out the tone of the book, and seen how everything actually fits together–sometimes it suddenly makes sense. And so, if you are furiously wracking your brain trying to come up with an ending before the stroke of midnight, relax. Sometimes outlines change as you are writing. Sometimes you just need all the pieces before the last one will fall into place. Just certainly don’t feel like you’re going to fail November if you can’t think of an ending right this second. NaNoWriMo is about being a little crazy, so go with the feeling and just start. Who knows, you might be like me and find it more interesting when you don’t know how the story will end before you get there. 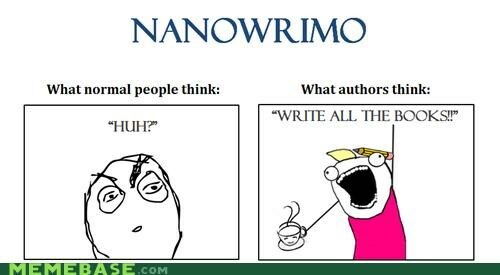 To learn more about NaNoWriMo, go to nanowrimo.org. Good luck to all participating!